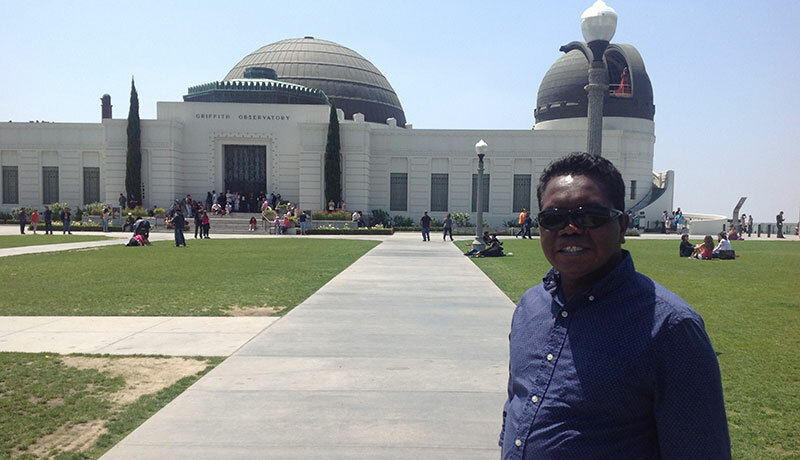 Last week I traveled to Los Angeles for a rare opportunity to reconnect with some Yolŋu friends, Wukuṉ Waṉambi and Yinimala Gumana. They just reached the last stop of a 4-week trip to the United States to work with the Kluge-Ruhe Aboriginal Art Collection. Mostly, I wanted to see them and learn about the project they’re working on, but I also thought it would be a good opportunity to get them on video for a post on this new blog. Perhaps they would answer some questions from the web. Perhaps Wukuṉ would follow up on his comments quoted in my first post. On arrival, I quickly decided to let that go and just hang out with them. They had been away from home for a long time, constantly traveling, performing, being poked and prodded and questioned, everywhere from the Smithsonian to the Getty. Yinimala had never been outside of Australia before, so nearly a month on a coast-to-coast USA trip must have been overwhelming. They met countless strangers who spoke to them in English. The best thing I could do was provide a familiar face, speak to them in their languages, and blast Yolŋu music as I drove them around town. To help them relax and feel at home. To make no demands of them. Because they’re people. Not ethnographic curiosities. They have no responsibility to constantly provide education, enlightenment or entertainment. I think back to my first visit to Yolŋu country with my wife in 1999. Two Aussies encouraged us to come. 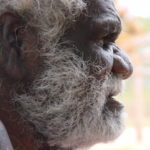 They told us they would connect us with Djalu’ Gurruwiwi so we could learn about yiḏaki from him at his home in Arnhem Land. It only took one night of sleeping in a tent behind his sister’s house before we began to feel that our presence was incredibly inappropriate. What if someone from another part of the world showed up at your door expecting to camp in your backyard for a couple of weeks? Expecting you to change your life to look after them, showing them around, teaching them how you live your life? It’s absurd, but it happens in Yolŋu country all the time. We weren’t the first, but we were early in a long line of Djalu’-crashers and my old website about the trip undoubtedly inspired others to follow in our footsteps. In 2004, my first year living in Yirrkala, Djalu’ and family barely had a week to themselves. Didgeridoo players from overseas would come and stay in tents for anything from a weekend to a couple of months. The sheer numbers and consistency were amazing to witness. The family of course allowed it and did their best to profit from it, but the constant stream of visitors was clearly draining. They later opted to work with a more professional tourism operation to control the numbers and guarantee an income stream for their time. There’s no huge point or dramatic conclusion to all of this. I’m simply sharing a few thoughts and reflections. I will post more later about the project Wukuṉ and Yinimala worked on here and try to get video someone else took of their “performance” to ceremonially open an event at the LA Consul-General’s residence. 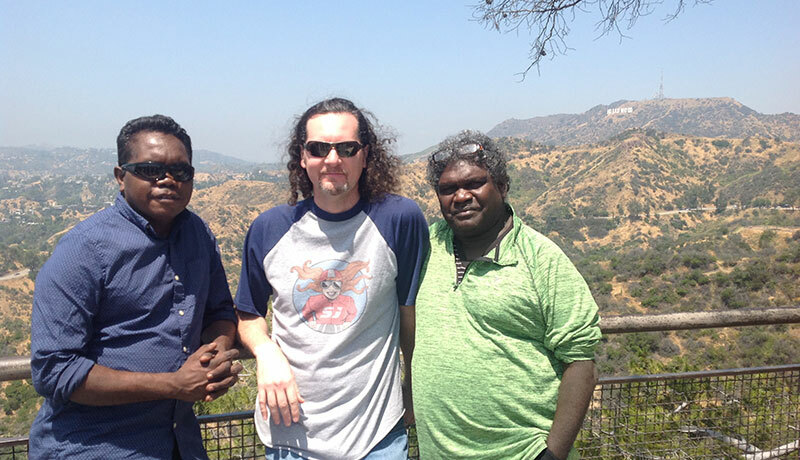 For now, I’ll share a few pictures from the only time I took out a camera to “document” my Yolŋu friends – as tourists at the Griffith Observatory. You can also see Wukuṉ’s own heavily-filtered pics from the trip on his new Instagram profile and many by the folks who brought Wukuṉ & Yinimala here on the Kluge-Ruhe account. This post, part 1 and the forthcoming conclusion are based on a paper presented on April 8, 2017 at the 2017 Society for Ethnomusicology Southwest Chapter Conference. In Part 1, we saw how the film Two Brothers at Galarra came to be. Now let’s break down the scenes and their music to see how Richard Waterman’s recordings were used and what they inspired. The film opens with Mathuḻu sitting by a fire, introducing the story with spoken word. As we will see later, this was in fact the last scene shot for the film. His narration also concludes the film over instrumental music carrying on from the final song. Mathuḻu’s appearance and guidance provides continuity with the 1952 recordings. The rest of the film has nearly wall-to-wall music of three types. These are of course the film’s inspiration and key soundtrack. 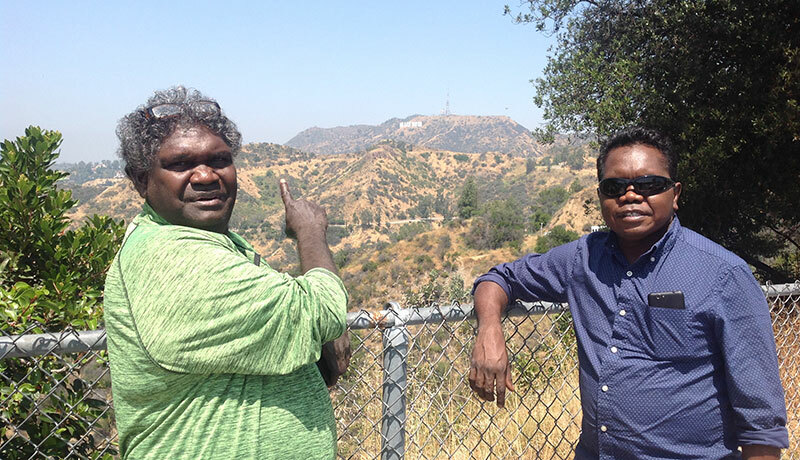 As the film transitions from Mathuḻu’s spoken introduction to the reenactment, Binydjarrpuma and Mathuḻu sing of paperbark trees and the winds that hit them at certain places on Wangurri clan land. We see the brothers beginning their journey in country as described. The other two songs from the original recordings are far more intense. The first sets the scene for the fight to come with a long build of tension as the brothers walk through grasslands close to the ritual fighting ground of their destination. The second powerfully accompanies the film’s climactic fight. The climactic spear fight, with subtitles of the words sung by Binydjarrpuma & Mathuḻu in 1952. The second category of music in the film was performed live with the dance scenes. Supervised by Mathuḻu, Malalakpuy lead the singing with Bibibak Munuŋgurr on didjeridu. Yolŋu land is alive with ancestral stories and powers. Cycles of song & dance tell and reenact these stories. On one evening of our shoot, twenty men and boys of Dhalinybuy sang and danced the journey depicted in the film to provide this context and, in the Yolŋu way of thinking, to tell the real story. Underlying powers and spirits in the land are the unchanging reality of the Yolŋu universe despite changing appearances or modern developments. They inform and influence the actions of humans. As the two brothers in the film journey across these ancestral lands, they come to embody the powers that lie within. The final film doesn’t contain the whole cycle, but three key sections remain and inform a knowing audience about what’s really going on. After the first signs of tension between the two brothers, they arrive at a place of the ancestral dog Gulutharra — a role model for the Wangurri clan warrior, as we shall see in the climax and denouement of the film. Here we get a vision of the song and dance of Gulutharra. Later, the song and dance of the fighting club birku indicate that the brothers are getting psychologically ready for a battle to come. In the credits, we get the song and dance of wakuluŋgul, the dissipating fog, to show that enmity is clearing. The decision was made to let the visuals of the dances carry the full impact here, hence the lack of translation of the songs. Dancing the fighting club Birku. We shot two scenes with no plan for music. Although I loved the unforgiving Yolŋu logic of the whole film thus far, we white people on set were concerned that the film would make no sense to non-Yolŋu viewers. We planned to add narration to these scenes to orient the audience. After editing the film, I brought Malalakpuy in to record the voiceover. I pressed play on the film for him to watch and started recording audio. He took me completely by surprise by beginning to sing rather than speak. 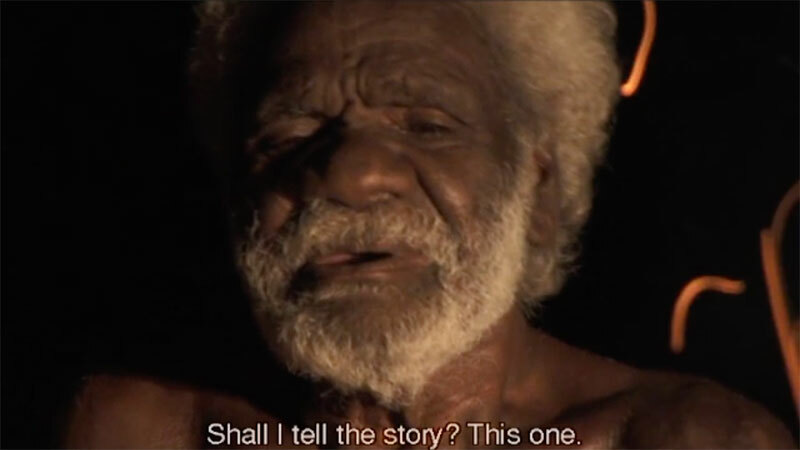 Just like the 1952 and dance scene music, his song had no clear narrative, but poetry invoking Yolŋu symbols that inform what is underneath what we are seeing on the screen. This was the third type, or perhaps layer, of music in the film — in-studio sung narration. It was decided to accompany this layer of music and some of the film’s transitions with non-Yolŋu instruments to create atmosphere and further distinguish it from the other music in the film. This sung narration worked beautifully for an early establishing scene and the aftermath of the climactic spear fight. “Binydjarrpuma” howling, with subtitles from Malalakpuy’s sung narration. Watch the film now, whether for the first time or a more informed repeat viewing. Recognize the different types of music and how they inform what is happening, both in the surface action and the underlying psychology. “Binydjarrpuma” & “Nyepayŋa” walk through the paperbark forest/swamp, accompanied by a 1952 recording of Binydjarrpuma & Mathuḻu singing. The words and pictures only give the slightest hints that a conflict is coming. Montage of the continued journey, spearfishing, etc., accompanied by Malalakpuy’s sung narration poetically describing the scene. “Binydjarrpuma” & “Nyepayŋa” reach a site associated with Gulutharra, the ancestral dog which is a role model for Wangurri warriors. “Binydjarrpuma” dreams the song and dance of Gulutharra. We see the intensity and that he is disturbed about what is to come. The brothers proceed through grasslands close to their destination as another 1952 recording plays, the lyrics more intense and clearly indicating the conflict that is to come. As they near the fighting ground at Galarra, we are treated to song and dance of the fighting club Birku. This is an obvious symbol of strength and preparation for battle. The climactic spear fight, accompanied by the most literal of the 1952 recordings, describing the skilled warrior preparing to accept a spear. “Binydjarrpuma” howls and imitates Gulutharra and leaves his wounded brother behind, as described in the sung narration by Malalakpuy. Mathuḻu, in spoken narration, reveals that Nyepayŋa survived what was merely a ritual clearing of animosity. He needed to accept a spear and bleed, but not to die. 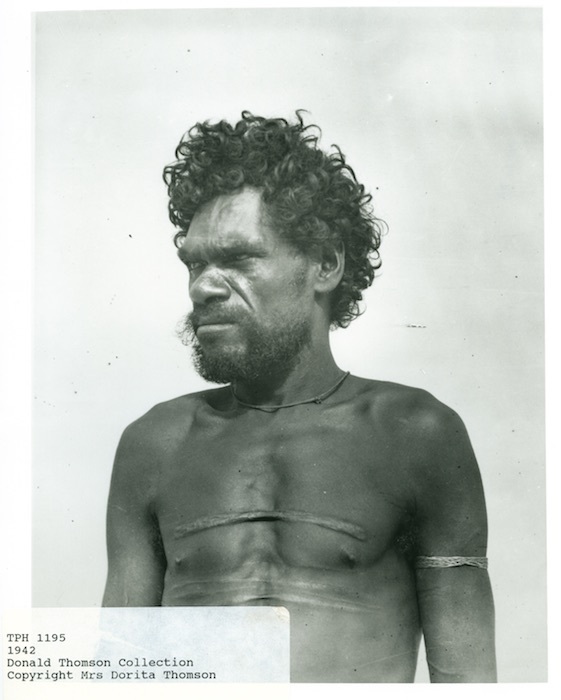 The concluding image of the real Binydjarrpumpa and Nyepayŋa was taken by anthropologist Donald Thomson in 1942, when both men were members of the Northern Territory Special Reconnaissance Unit. End Titles. The men of Dhalinybuy sing and dance Wakuluŋgul, the dissipating fog, to indicate the clearing of grievances. This concludes Part 2. In the third and final part, I will discuss what went right and what went wrong in the making of the film, and what implications it raises for the idea of ethnomusicology coming full circle. This post, part 2 and the forthcoming followup are based on a paper presented on April 8 at the 2017 Society for Ethnomusicology Southwest Chapter Conference. Part 1 discusses how one American ethnomusicologist’s work inspired indigenous Australians to create a new work of art including four generations of their clan. 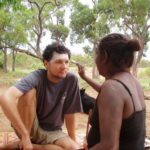 Dr. Richard A. Waterman of Northwestern University lived with Yolŋu Aboriginal People on the remote mission of Yirrkala on the north coast of Australia while on a Fulbright Fellowship and grant from the American Philosophical Society. I can’t tell you why. Most of his published work stems from his interest in the African diaspora, including jazz, although he later co-edited a volume of papers from a symposium on change in Aboriginal Australia. Not many anthropologists visited Yirrkala before him since its founding in 1935, but many came after. Some became inextricably linked to the community’s history and are regularly referred to in the literature about the region and its people. Not so for Dr. Waterman. He never returned, was forgotten by the Yolŋu and is not often referred to by academics studying the area. However, as the first ethnomusicologist to show up in Yirrkala with a recorder and lots of tape, he left behind an unparalleled treasure trove of audio that upon rediscovery became much beloved by the Yirrkala community of today. I did not study ethnomusicology or anthropology. My interest in Aboriginal Australia began when I started playing the didjeridu while a music composition student at the University of California at San Diego in 1993. In these heady early days of the internet, email listservs were the hot form of social media. On one of them, didjeridu players around the world emailed each other about the instrument. In 1999, only a few of us on that list in the United States were passionately interested in the origins of the instrument as opposed to its contemporary uses. One learned of the existence of Waterman’s recordings in the Indiana University Archives of Traditional Music, obtained copies of most of them through his work, and shared those with me before my first visit to Arnhem Land. On that trip in 1999, I got to know the family of renowned yiḏaki, or didjeridu, expert Djalu’ Gurruwiwi. Djalu’ loved hearing his father Monyu on Waterman’s recordings. I earned my own Fulbright Fellowship in 2003 to follow in Waterman’s footsteps and spend a year in Yirrkala doing a Master’s project on issues of globalization and commercialization of the didjeridu. After I spent a year as a volunteer, Buku-Ḻarrŋgay Mulka, the community art centre, hired me and sponsored my migration to Australia. I brought my copies of Waterman’s recordings as conversation-starters for my research and to share with the community. Early on, I got to know Wangurri clan families from the outstation community of Dhalinybuy (see map above). 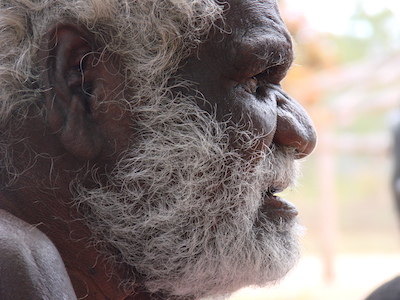 Once, in that first year there, 2004, I spotted one of the Wangurri elders, Mathuḻu, at the art centre and called him over to my desk, saying, “listen to this.” I pulled up the small collection of his clan’s songs that Waterman had recorded and played them for Mathuḻu, who calmly listened with approval and then asked for a copy. Wangurri clan warrior “Slippery” Binydjarrpuma, 1942. Photo by Donald Thomson. The notes on the recordings were understandably not very good by today’s standards. Waterman did not have much command of Yolŋu languages. In fact, very few outsiders did. Work to standardize the writing of the languages only began in the early 1950s. 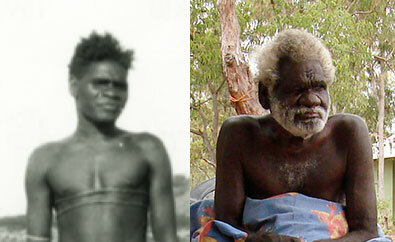 It was clear, however, that the main singer of the two men on the Wangurri tracks was “Slippery” Binydjarrpuma, a legendary warrior and sometimes renegade who was notorious right from the beginning of contact between Yolŋu and Euro-Australian people less than 30 years earlier (see works by Dr. Donald F. Thomson). Dhambudjawa, a well-known master of the day, played the yiḏaki, or didjeridu. The notes indicated that Binydjarrpuma and Dhambudjawa were joined by Galalpi. Mathuḻu Gaḏal’miny Munyarryun, circa 1948 & 2007. Mind blown. Children’s songs on the recordings included currently living people, but I did not expect to find old men still alive who sang on Waterman’s “grown up” material. Mathuḻu AKA Gaḏal’miny as a young man sang with his uncle (by our way of thinking), or second father (by Yolŋu thinking). A few years later, I launched the Mulka Project, a new multimedia wing of the art centre dedicated to a) repatriating all the media we could about the community that had been created by outsiders into a community-accessible archive and b) training the Yolŋu to take the reigns of modern media to tell their own stories from now on. One of my first actions was to contact the Indiana University Archives of Traditional Music about getting copies of the entire Waterman Collection. They responded with great news. They were about to begin re-digitizing their entire collection and would start with the Waterman Collection for us. The new recordings were far better quality and included a lot of spoken word and secret-sacred recordings that were not in my old copies. Around this time, one of Mathuḻu’s sons, Malalakpuy, told me his father needed a new copy of the CD I had given him. Malalakpuy hadn’t heard it, so I played the songs as I was burning a copy. He perked up and started telling me about the songs. Three were of particular interest. They told of a journey across certain of their clan lands, and of two brothers, “playing with spears.” It later came out that in fact this was the story of Binydjarrpuma journeying to a place of ritual combat to spear his own brother. Malalakpuy came back a few days later with his brother Baṉḏamul and a proposal. They wanted to use the resources of the new Mulka Project to create a film with the two of them recreating the events described in the songs, using the old audio as soundtrack along with newly recorded song and dance reflecting the important totemic places along the journey. This was exactly the sort of thing I wanted the Mulka project to do, and I was overjoyed that this idea had come about organically through our work. I hired two Australian film industry professionals to act as mentors for the project. Director Tom Murray spent a good deal of time in the area making his documentaries Dhäkiyarr vs. the King and In My Father’s Country. Cinematographer Bonnie Elliott participated in our first filmmaking workshop for young Yolŋu. Three of those students, Biyalŋa Biḏiŋgal, Bunbuyŋu Marika and Dhamarrarr Munuŋgurr, came along as trainee crew. We headed out for the hour and a half drive through the bush to Dhalinybuy, a remote community of less than 100 people of the Wangurri and related clans – our cast and the rest of our crew. Malalakpuy would co-star with Baṉḏamul while another brother, Banul would co-direct with him. Gurumin Marika, a senior djuŋgaya, or cultural custodian, of the Wangurri clan, would act as consultant and guide. This concludes part 1. Part 2 discusses the film itself and the music in it. Finally, the forthcoming part 3 will discuss what went right and wrong, suggesting issues with ethnomusicology and documentation of culture. Next time, off to Dhalinybuy! 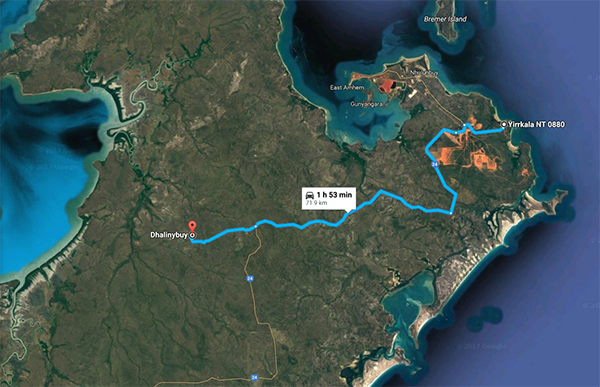 Yirrkala to Dhalinybuy. 1 h 53 min? We did it faster than that. Yirdaki, Yiḏaki, Yidaki, Yiragi. Let’s call the whole thing off. Shall we look at the exciting topic of SPELLING? Have you ever wondered why are there so many different spellings of the main Yolŋu word for “didgeridoo?” Or should that be “didjeridu?” “Didgeridu?” “Didjeridoo?” And now we’re off the rails already. Get back to the point. That’s not even the word we’re talking about. OK. The reason it’s hard to standardize the spelling of the Yolŋu word is simple. It’s not an English word. It contains one particular sound that we do not make in English – the retroflexed [d]. To produce the sound, touch the tip of your tongue to the back of the alveolar ridge – that bump behind your top teeth – and then say a [d]. Don’t push way back to the roof of your mouth. Just touch the edge of that ridge. When you say a “normal” [d], the tip of your tongue touches just behind the teeth. For the Yolŋu retroflexed [d], you move the tip of the tongue back about a centimeter. For North American English-speakers like me, Spanish-speakers, 18th century pirates, and many others, your tongue is curled back the same amount as to say the letter [r], but you move the tip of your tongue straight up until you touch the ridge to make it a modified [d] instead. That’s it. Yolŋu do the same with the letters [l], [n] and [t]. Since we don’t make that sound in our languages, we don’t have a way to write it. When we just write “yidaki,” we’re ignoring the issue and letting readers think of the [d] they know. Which, honestly, is fine most of the time. “Yiḏaki” and “yirdaki” use [ḏ] and [rd] as code to indicate the retroflexed position, but they only work for readers who know the code. Let’s look at that. Since Beulah Lowe’s pioneering work to document Yolŋu languages at Milingimbi mission in the 1950s, underlining the consonant [d], [l], [n] or [t] has been the standard way to write retroflexed letters in these languages. It’s what all the Yolŋu I know do. It’s in their educational materials and on signs around town. To me, this is the best way. As I said, it just doesn’t mean anything to you until you know the code. Now you know. Some academics have used the [rd], [rl], [rn], [rt] convention to indicate the retroflexed tongue in Aboriginal languages. Once again, it is a code that works for readers who know the code. It makes sense because, as we’ve seen, the retroflexed [d] uses a curled tongue like an [r], but you touch the gum ridge to make a harder consonant. Moving into that position from a vowel sounds ALMOST like you’re saying an [r] first. Yolŋu languages never use a separate “rd” sound like in the English word, “card.” You simply won’t see those letters together in Yolŋu words. So using [rd] to indicate the retroflex does not create any confusion – again, IF readers know the code. These have way too much [r] sound in them. We’ll hear some Yolŋu for comparison at the end. They will sound ALMOST like they’re saying an [r], but it’s much less pronounced and much quicker. If you read old books by early missionaries and anthropologists, you’ve probably seen variations like these. I’ve seen them on lists of indigenous names of the didgeridoo. They’re not different names – just early attempts by outsiders to write “yiḏaki” before much study had been done on the language. So, to be brief, don’t use them and don’t worry about them! I choose to use “yidaki” whenever possible and “yidaki” when typing on a device that makes underlining difficult or impossible. While “yirdaki” works for people who know the code, that is a tiny portion of the world’s population, so I don’t think it’s a good choice for use on the internet. People don’t know the code behind “yidaki” either, but at least it doesn’t make them say “yerdockey.” Hopefully it makes them pause and be curious, or better yet to go research it. By using only known “English” letters, “yirdaki,” on the other hand, can give the false impression that it communicates a full and proper pronunciation of the word. Whatever you choose, at least now you understand why the confusion of a choice exists. Many people like to capitalize “Yidaki.” They consider it a special name for a special object and feel that this shows it more respect. This is not technically correct. “Yiḏaki” is not a proper noun. It is the general word for the musical instrument, just like “guitar” or “violin.” If we capitalize “yiḏaki, ” we should also capitalize other Yolŋu nouns like their words for “spear,” or “food.” It would get ridiculous. When it comes to more specific types of yiḏaki, like Dhaḏalal and Djuŋgirriny‘, then yes, those are proper nouns and are capitalized. They are to yidaki what Stratocasters and Les Pauls are to guitars. Make sense? I hope this clears up any confusion and can serve as a reference for the future. Let’s wrap up by listening to a bunch of Yolŋu People from nine different clans say “yiḏaki,” shall we? Note that like any people of any culture anywhere, all Yolŋu don’t pronounce words the same as all other Yolŋu and individuals don’t always pronounce any given word exactly the same every time. I find the variation in the hardness and relative [r]-ness of the [ḏ] in these clips interesting. 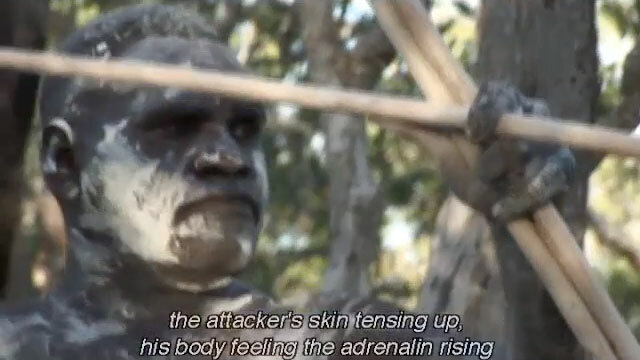 YOLŊU PEOPLE ARE WARNED: This video contains several deceased people from the Djapu, Wangurri, Dhaḻwaŋu and Gumatj clans. As I launch this new blog, I have to answer one question for both myself and you, dear reader. Why? Is there not enough content on the internet? What do I still have to add to discussion of these stringybark logs called yiḏaki? Most importantly, do Yolŋu People need or want this? Let’s go back a bit. When I started playing the instrument in 1993, I wanted to be a didgeridoo star. I formed a band, recorded CDs, taught workshops. My first visit to Arnhem Land in 1999 changed my perspective. Advocacy for the people at the origin grew more important. In 2003, after a few more visits and much study, I won a Fulbright Fellowship to pursue a Master’s Degree in Aboriginal & Torres Strait Islander Studies at Charles Darwin University. I moved to Yirrkala, an Aboriginal township in remote northeast Arnhem Land. I created the comprehensive didgeridoo information website Yiḏakiwuy Dhäwu Miwatjŋurunyda with many Yolŋu partners and some generous volunteer translators in Europe. Buku-Ḻarrŋgay Mulka, the art centre in the community of Yirrkala, hired me as assistant coordinator, yidaki specialist and then founding coordinator of The Mulka Project, a new multimedia centre wing that repatriated documentation of local culture and produced new materials. All my time and energy supported Yolŋu and advocated for their interests rather than my own. I found myself at a loose end when a family medical crisis brought me back to the USA in 2009. Didgeridoo was a huge part of my life to that point, but I was no longer on the ground in Arnhem Land to work with the people I represented there. I couldn’t go back to old ways and promote my own self as didgeridoo star with any integrity. I shied away from the didgeridoo world for a few years. 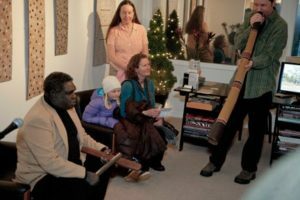 Then in 2015 I developed the show A Personal History of the Australian Didgeridoo to perform and educate by telling my story with the instrument and playing appropriate pieces along the way. I had some great experiences touring it, but was also confronted by the fact that most American didgeridoo players’ main interest was to make their own instruments and play them their own way. Overall, there is only a passing interest in the yidaki and its origins. I can’t say they are wrong, only that it does not jive well with many of my Yolŋu friends’ wishes. A decrepit but beloved old website. Meanwhile, the website Yiḏakiwuy Dhäwu Miwatjŋurunyda had aged poorly. It was designed in another time, to be uploaded via dialup internet in a remote corner of the world. It required a special font. Although we promised it as a permanent resource, web designers unceremoniously deleted it in an overhaul of Buku-Ḻarrŋgay Mulka’s site. After struggling to get it back up and then seeing it deleted a second time by another designer, I registered the domain yidakistory.com as a new permanent home for the Dhäwu. I wanted to update it, but as an artist, didn’t have time for a big unpaid project. The demands of making a website for the range of devices people use today intimidated me. Then I discovered that the videos wouldn’t play on my new computer. When I saw Omar from Mexico and Loïc from Spain posting on Facebook about the Spanish-language version, standing by it in all its half-working glory, I decided it was time to update it. Thanks to way more generosity than I thought I would receive from the crowdfunding world (you know who you are! ), I raised funds to do the project in July-August 2016. I never had any doubt that keeping the website alive was in the best interests of the Yolŋu I had worked with to create it, but around this time came an unexpected benediction from one of them. Wukun Wanambi was one of my close friends and colleagues in Yirrkala as one of Buku-Ḻarrŋgay Mulka’s more successful artists and a founding Cultural Director of the Mulka Project. I interviewed him for the Yiḏakiwuy Dhäwu despite questions from others. “Why? He’s not a yidaki player!” I wanted a large cross section of Yolŋu voices on the website, but more importantly, Wukuṉ is a singer and young leader of the Marrakulu clan. They are the main local holders of gaḏayka, the stringybark tree that most yiḏaki are made from. He spoke to me in the past about his concerns. Others around the world were giving the didgeridoo, born from his own clan’s very soul, a new life without regard for its origins. 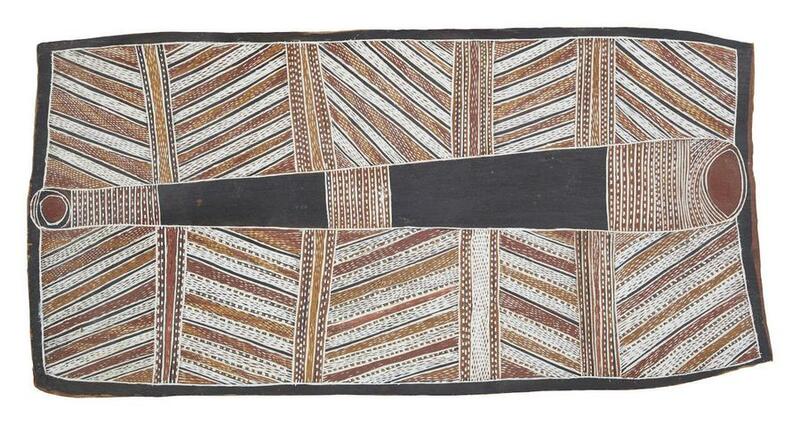 This painting on stringybark by the late Marrakulu artist and leader Ḏuṉḏiwuy Waṉambi may surprise you. You might assume that it shows a yidaki and be confused by the title, Ceremonial Ground Design Associated with the Sugarbag Ceremony. In certain Marrakulu ceremony, Yolŋu dance in and around the sand sculpture Gundimulk. You know what? It’s kind of also a yidaki. And a ḻarrakitj, the hollow log coffin made from larger stringybark trees. It’s the home of the honey bees. It’s the stringybark tree itself. The Marrakulu clan family name Waṉambi is in fact a special name for gaḏayka. And it’s the river Gurka’wuy that runs through their land and empties into the sea at what the map calls Trial Bay. It is the whole of the stringybark and everything connected to it. 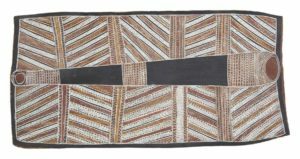 Yolŋu art has many layers of meaning – a phrase I learned from the work of Aboriginal art scholar Howard Morphy. If you can, get your hands on the film Djungguwan at Gurka’wuy to hear Ḏuṉḏiwuy himself talk more about this story. In August 2016, right when the Yiḏakiwuy Dhäwu crowdfunding campaign wrapped up, I got a rare email from Wukuṉ out of the blue. He never uses email. While in Melbourne for an art exhibition, he called on a common friend to write to me on his behalf. After some catching up, the conversation moved on to his continued concern for the yidaki around the world. Now today, people are still asking me a question about yidaki and this reminds me of you playing didj in America. I know nowadays, yidaki is gone out into the world. It means Dhuwa side ga Yirritja side. It comes from one tree the stringybark yäku (called stringybark). But to name the yidaki name… I think you know what I am saying. 2. Do not trespass the yidaki because that belong to Yolngu. 3. Put it in the surface side but don’t dig the gold because we don’t dig your gold. As you know, today the yidaki is now a musical instrument in the world that is really not run by Yolngu, but by a lot of people. These are a few things that I am protesting in the protocol side. My friend, I am not criticising, I am debating in a manner that I respect you and professional player of yidaki in the world, knowing that in this world we should work together somehow, because nothing is run by Yolngu only Ngäpaki. I’m saying this because the future of our generation might not be doing this. Yidaki be still around but it will be all whitefella’s entertainment. Coming right on the heels of the Dhäwu crowdfunding campaign and my own questions about my role in supporting the culture that created the yidaki from afar, this seemed an incredibly auspicious benediction. 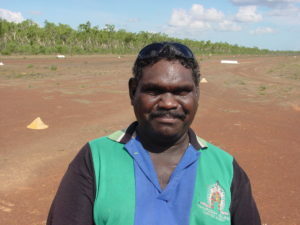 My Yolŋu friend and colleague, a stringybark man, suddenly reached out with a new, personal revision of the 1999 Garma Yidaki Statement that inspired my 2004 Fulbright & master’s project in the first place. He still wants the story spread, and he still wants us to work towards more cooperation between the origin of the didgeridoo and those who are spreading it around the world. Humility killed the didgeridoo star. With Gayili Yunupiŋu, 2004. And with that, I launch this blog. I’ll write one to four posts a month, depending on the size. Some big, some tiny. Reflections on my experiences in Arnhem Land. Reviews of books and films related to Yolŋu culture. Additions to the material in the Yiḏakiwuy Dhäwu. Over time, guest posts from Yolŋu. The ever popular more. 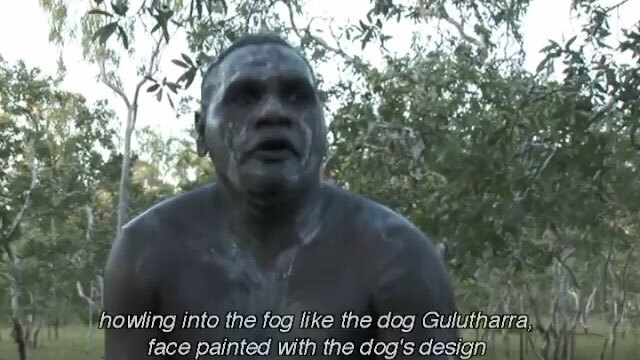 This American who went down the rabbit hole of yidaki and Yolŋu culture will share his experience with you to deepen your awareness of the culture that brought us this wonderful instrument that we all love. Please consider supporting this blog. Web hosting isn't free. I'm sharing from a lifetime of experience & study and trying to build this into a project that will fund new work on the ground in Arnhem Land. 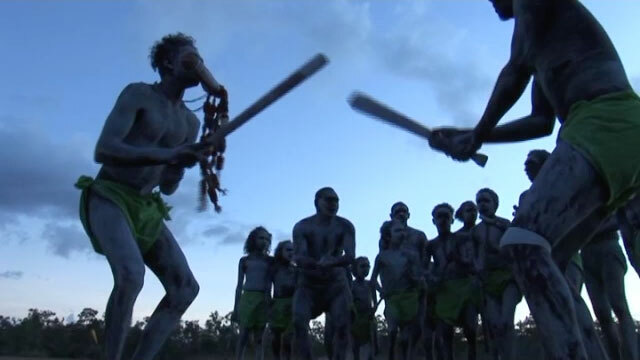 THE instructional recording in Yolŋu yiḏaki playing by Milkay Munuŋgurr. 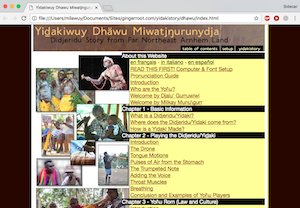 THE didgeridoo/didjeridu/yiḏaki information website made with Yolŋu People, available in several languages. 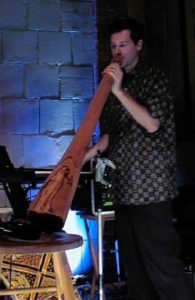 Randin Graves worked with Yolŋu People of northeast Arnhem Land to create Hard Tongue Didgeridoo and Yiḏakiwuy Dhäwu Miwatjŋurunydja as reference works about the yiḏaki, or didjeridu. This new site adds a blog for his own thoughts to help worldwide didgeridoo players gain more insight into the culture that created the instrument from a fellow outsider who lived in it.